What would constitute AGW being a major problem? Ron Clutz has an excellent post. This time on he reports on A Critical Framework for Climate Change. In the post Ron looks at the Karoly/Tamblyn–Happer Dialogue on Global Warming at Best Schools particularly at Happer’s major statement. In my opinion these dialogues are extremely useful, as (to use an old-fashioned British term) are antagonists are forces by skilled opponents to look at the issues in terms of a level playing field. With the back and forth of the dialogue, the relative strengths and weaknesses are exposed. This enables those on the outside to compare and contrast for themselves. Further, as such dialogues never fully resolve anything completely, can point to new paths to develop understanding. Ron reprints two flow charts. Whilst the idea is of showing the issues in this way to highlight the issues is extremely useful correct. I have issues with the detail. In particular on the scientific question “Is it a major problem?“, I do not think the “No” answers are correct. (c) the time taken for rises on a trace gas to raise temperatures. As these are all extremely difficult to measure, so a huge range of equally valid answers. It is an example of the underdetermination of scientific theory. At the heart of the underdetermination of scientific theory by evidence is the simple idea that the evidence available to us at a given time may be insufficient to determine what beliefs we should hold in response to it. But even if significant human-caused warming can be established, this does not constitute a major problem. Take sea-level rise. If it could be established that human-caused warming was leading to sea level rise, this may not, on a human scale, be a major problem. At current rates sea levels from the satellites are rising on average by 3.5mm per year. The average adjusted level from the tide gauges are less than that – and the individual tide gauges show little or no acceleration in the last century. But if that rate accelerated to three or four times that level, it is not catastrophic in terms of human planning timescales. The real costs to humans are expressed in values. The really large costs of climate change are based not so much on the physical side, but implausible assumptions about the lack of human responses to ongoing changes to the environment. In economics, the neoclassical assumptions of utility maximisation and profit maximisation are replaced by the dumb actor assumption. An extreme example I found last year. In Britain it was projected that unmitigated global warming could lead to 7000 excess heatwave deaths in the 2050s compared to today. The projection was most of these deaths would occur in over 75s dying in hospitals and care homes. The assumption was that medical professionals and care workers would carry on treating those in the care in the same way as currently, oblivious to increasing suffering and death rates. Another extreme example from last year was an article in Nature Plants (a biology journal) Decreases in global beer supply due to extreme drought and heat. There were at least two examples of the dumb actor assumption. First was failure by farmers to adjust output according to changing yields and hence profits. For instance in Southern Canada (Calgary / Edmonton) barley yields under the most extreme warming scenario were projected to fall by around 10-20% by the end of the century. But in parts of Montana and North Dakota – just a few hundred miles south – they would almost double. It was assumed that farmers would continue producing at the same rates regardless, with Canadian farmers making losses and those in Northern USA making massive windfall profits. The second was in retail. For instance the price of a 500ml bottle of beer in Ireland was projected to increase under the most extreme scenario in Ireland by $4.84 compared to $1.90 in neighbouring Britain. Given that most of the beer sold comes from the same breweries; current retail prices in UK and Ireland are comparable (In Ireland higher taxes mean prices up to 15% higher); cost of a 500ml bottle is about $2.00-$2.50 in the UK; and lack of significant trade barriers, there is plenty of scope with even a $1.00 differential for an entrepreneur to purchase a lorry load of beer in the UK and ship it over the Irish Sea. Another example of the distinction between a mere difference and a major problem is the February weather. Last week the UK experienced some record high daytime maximum temperatures of 15-20C. It was not a problem. In fact, accompanied by very little wind and clear skies it was extremely pleasant for most people. Typical weather for the month is light rain, clouds and occasional gales. Children on half-term holidays were able to play outside, and when back in school last week many lessons were diverted to the outdoors. Over in Los Angeles, average highs were 61F (16C) compared to February average of 68F (20C). This has created issues for the elderly staying warm, but created better skiing conditions in the mountains. More different than a major problem. So in summary, for AGW to be a major problem it is far from sufficient to establish that most of the global warming is human caused. It is necessary to establish that the impact of that warming is net harmful on a global scale. Ron Clutz, at his Science Matters blog, has a penchant for producing some interesting articles that open up new areas outside of the mainstream of either climate alarmism or climate scepticism, some of which may challenge my own perspectives. With Critical climate intelligence for jurists and others, Ron has done this again. Generally in tort cases involving public nuisance, there is a term, which we all know from negligence cases and other torts, called proximate causation. In proximate causation, there is a “but for” test: but for the defendant’s activity, would the injury have happened? Can we say that climate change would not have happened if these power plants, these isolated five power plants, were not emitting greenhouse gases? If they completely stopped, would we still have global warming? If you shut them down completely and have them completely dismantled, would we still have global warming? I think Faulk then goes off the argument when he states. Is it really their emissions that are causing this, or is it the other billions and billions of things on the planet that caused global warming—such as volcanoes? Such as gases being naturally released through earth actions, through off-gassing? Is it the refinery down in Texas instead? Is it the elephant on the grasses in Africa? Is it my cows on my ranch in Texas who emit methane every day from their digestive systems? How can we characterize the public utilities’ actions as “but for” causes or “substantial contributions?” So far, the courts haven’t even reached these issues on the merits. A necessary (but not sufficient) condition to be met for adverse human-caused global warming to be abated, is that most, if not all, human GHG emissions must be stopped. Unlike with smoke particulates, where elimination in the local area will make a big difference, GHGs are well-mixed. So shutting down a coal-fired power station in Oak Creek will have the same impact on the future climate change for people of South-East Wisconsin as shutting down a similar coal-fired power station in Boxburg, Ningxia, Mpumalanga, Kolkata or Porto do Pecém. That is in the range of zero or insignificantly different to zero depending on your perspective on CAGW. Proximate causation was a term that I should have used to counter Minnesotan valve-turners climate necessity defense. As I noted in that post, to reduce global emissions by the amount desired by the UNIPCC – constraining future emissions to well below 1000 GtCO2e, requires not only reducing the demand for fossil fuels and other sources of GHG emissions, but also requires many countries dependent on the supply of fossil fuels for a large part of their national incomes, to leave at least 75% of known fossil fuel reserves in the ground. Senator Bernie Saunders of Vermont was for a while running a close second to Hillary Clinton in the Democrat Primaries. Had his extreme left views, advanced years and the fact that he is the junior Senator from the 49th most populous State, he might have stood a chance against a former First Lady and Secretary of State. But Senator Sanders’ recent questioning of Scott Pruitt shows why he is unfit for high office. Ron Clutz has transcribed more of the dialog, by I think two statements encapsulate this. As you may know, some 97% of scientists who have written articles for peer-reviewed journals have concluded that climate change is real, it is caused by human activity, and it is already causing devastating problems in the US and around the world. Do you believe that climate change is caused by carbon emissions from human activity? One could answer “yes” if you thought that 10% of the rise in the was due to land use changes, and the rest due to natural factors. It does not ask about fossil fuel emissions, and the question allows for belief in other factors other than human activity whether known or unknown. Neither does it ask if temperature rise is net harmful, with huge devastating impacts already evident. There is also the Cook et. al survey of peer-reviewed academic papers that I looked after listening to a lecture Cook gave at Bristol University in late 2014. The survey just looked to the assumption that humans cause some warming, whether explicit or implied. Like the Doran and Zimmerman survey it is just hearsay. This Sen. Sanders presents as good evidence that there is already a clear catastrophic problem caused by changes in the climate. If there is real and overwhelming evidence, why does Sen. Sanders not refer to that instead of misrepresenting bogus opinion polls? While you are not certain, the vast majority of scientists are telling us that if we do not get our act together and transform out energy system away from fossil fuel there is a real question as to the quality of the planet that we are going to be leaving our children and our grandchildren. So you are applying for a job as Administrator at the EPH to protect our environment. Overwhelming majority of scientists say we have to act boldly and your’re telling me that there needs to be more debate on this issue and that we should not be acting boldly. Sanders now says a majority of scientists are telling us we must change our energy systems. Aside from the fact that only a very small minority of scientists have any sort of competency in the field of climate, (and there is evidence a lot of demonstrated incompetency within the small group e.g. here), they have no expertise in the economic or moral cases for policy. For policy the interpretation of the moral imperatives and the practical possibilities should be the realm of politicians. For those who sit on specialist committees, they should at least have their own developed views on the field. Senator Bernie Saunders has taken some very dodgy opinion polls, grossly exaggerated the findings, and then ascribed statements to the climatologists that are far removed, and way beyond, any competencies they might have. As I see it, the role of President of the United States, as a leader, is to critically interpret what they are given in order to make decisions for the nation. That is the exact opposite of what Sanders did last week. Cheap fossil fuels were undoubtedly a major element in China’s very high levels of economic growth. If Canada were to unilaterally cut its emissions, the impact on global emissions would be tiny. A reduction in economic growth of 0.01% from now to 2100 would have a larger value in 2100 than the projected monetary costs of catastrophic climate change in 2100. Developing nations with up to two-thirds of global emissions, are excluded from any obligation to constrain emissions under the Rio Declaration. Climate mitigation increases unit energy costs, creating a comparative disadvantage for policy countries. If non-policy developing countries were later to adopt mitigation policies, they would not only have higher energy costs, but would lose the comparative advantage of being a non-policy country. A few countries pursuing climate mitigation policies increases the marginal cost of other countries adopting similar policies. Ron points to the benefits of increased CO2 levels, such as from increased plant growth. But, by far the biggest benefit is the from the use of fossil fuels as an engine of economic growth. I made two comments, which are slightly amended here. How much did fossilized carbon fuel China’s economic growth? By far the most important point made in Ron’s article is the impact of fossil fuels on economic growth rates. Take China – the most extreme example in history, at least for major economies, According to the UNFCCC country brief produced for COP21 Paris, economic growth in China averaged 10.3% pa from 1990-2012. In the same period CO2 emissions increased by 6.1% pa. It meant GDP per capita (with 19% population growth) was 7.25 times higher in 2012 than 1990, and emissions per capita were over 3 times higher. How much of the economic growth would have happened without the huge investment in cheap energy sources – principally coal? If economic growth would have averaged a mere 7%, GDP per capita would have 3.7 times higher in 2012 than 1990. This is why people in China are willing to suffer the terrible, acrid, pollution that engulfs many major cities. Whilst unable to estimate the effects of cheap energy on China’s phenomenal growth, I would still contend that the compound effect on economic growth of cheap fossil fuels is far greater than the estimates of the projected harms of climate catastrophe. At the start of December Ron Clutz had a post Climate Costs in Context. This referred to a Manhattan Institute Report which estimated the costs of global warming could reach $15trn by 2100 – or 2.5% of global output of $600trn. Reducing economic growth by 0.03% would have the same effect on output, though people would accept a much bigger reduction in growth to avoid 2.5% costs of catastrophes. This leads to a bigger issue, that it not discussed. Suppose an economy like Canada with 1.5% of global emissions, unilaterally imposed a policy from January 1st 2017 that was guaranteed to reduce emissions by 90% by 2100. Without the policy, global emissions would be double 2016 levels in 2100. With the policy they will be 1.9865 times higher. (1) 2100 costs of climate change are 2.50% of GDP globally and for Canada, without Canada’s policy. (2) 2100 costs of climate change are 2.45% of GDP globally and for Canada, with Canada’s policy. (4) All outcomes and calculations are certain. Even then, the the descendants in 2100 Canada would still not thank the current generation, as output would be 8% lower, to save costs of just 0.05% of GDP. If current GDP is C$1600bn, with 2% growth GDP in 2100 will be C$8443bn. At 2.5% costs of climate change will be $211bn. Reduce that to 2.45% reduces costs by just over $4.2bn. But GDP with 1.99% growth GDP will be 8% or $668bn lower. 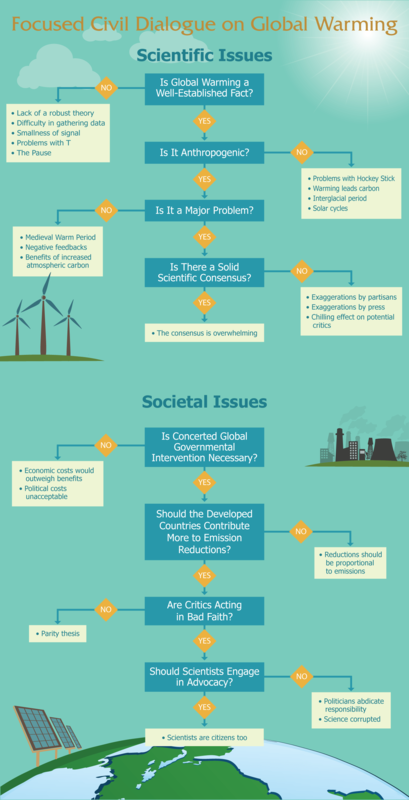 Even if all countries reduced emissions by 90% (and thus reduced costs of climate change to effectively zero) mitigation policy would may not make sense on these “heroic” assumptions. Canada would exchange $210bn of random catastrophic costs for $668bn of certain costs. But that would be only if the costs were totally random. If costs were in part predictable, then, without the economic growth impact of climate mitigation policies, additional economic could be used to counteract the direct effects of the warming through adaptation. But the reality is much closer to Canada acting unilaterally; there are significant policy costs; and the impact on growth is far greater. Worst of all, is the competitive impact. (b) A country, like Canada, with aggressive climate mitigation policies, is competing on world markets with less developed countries with little or no mitigation policies. (c) Climate Mitigation policies, like renewables or a carbon tax, increase unit energy costs. (d) Some industries with globalized market, like steel, aluminium, shipbuilding or chemicals, energy costs form a significant part of the costs of production. I would suggest that the imposition of climate mitigation policies increases the unit cost of production, creating a comparative disadvantage compared to countries with little or no mitigation policies. 2017 marks the 200th anniversary of David Ricardo’s theory of comparative advantage. Ably explained by Prof Donald J. Boudreaux, it is perhaps the only principle in economics that it universally true. Climate mitigation is only being pursued, in varying degrees, by a limited number of countries. Developing nations with up to two-thirds of global emissions, are excluded from any obligation to constrain emissions under the Rio Declaration. Developed countries, by imposing mitigation policies, create comparative advantages to the non-policy developing countries that they trade with. Therefore, the marginal cost of those developing countries adopting mitigation policies is greater if developed countries have already mitigation policies in place, than if all countries had adopted them together in equal measure. This implies that those economies like Russia, South Korea and China, who might be able to afford to adopt climate mitigation on the increased energy costs alone, will not do so due to competitor countries having established costly mitigation policies. Ron Clutz’s introduction, based on a Scientific American article by John Horgan on January 4, 2016, starts to grapple with the issues involved. The take home quote from Horgan is on the subject of false positives. “Here is my more general statement of that principle: The plausibility of your belief depends on the degree to which your belief–and only your belief–explains the evidence for it. The more alternative explanations there are for the evidence, the less plausible your belief is. That, to me, is the essence of Bayes’ theorem. “Alternative explanations” can encompass many things. Your evidence might be erroneous, skewed by a malfunctioning instrument, faulty analysis, confirmation bias, even fraud. Your evidence might be sound but explicable by many beliefs, or hypotheses, other than yours. With respect to the question of whether global warming is human caused, there is basically a combination of three elements – (i) Human caused (ii) Naturally caused (iii) Random chaotic variation. There may be a number of sub-elements and an infinite number of combinations including some elements counteracting others, such as El Nino events counteracting underlying warming. Evaluation of new evidence is in the context of explanations being arrived at within a community of climatologists with strong shared beliefs that at least 100% of recent warming is due to human GHG emissions. It is that same community who also decide the measurement techniques for assessing the temperature data; the relevant time frames; and the categorization of the new data. With complex decisions the only clear decision criteria is conformity to the existing consensus conclusions. As a result, the original Bayesian estimates become virtually impervious to new perspectives or evidence that contradicts those original estimates. Bayesian statistics “are rippling through everything from physics to cancer research, ecology to psychology,” The New York Times reports. Physicists have proposed Bayesian interpretations of quantum mechanics and Bayesian defenses of string and multiverse theories. 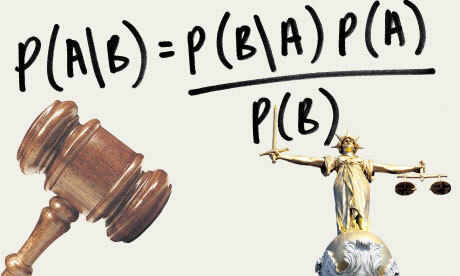 Philosophers assert that science as a whole can be viewed as a Bayesian process, and that Bayes can distinguish science from pseudoscience more precisely than falsification, the method popularized by Karl Popper.